POSTED February 27, 2019 12:38 p.m. Junior Courtney Budden threads a bounce pass to teammate Sami Martin during Platteville’s 52–27 D3 regional semifinal victory over Dodgeville Friday night. PLATTEVILLE — It’s been anything but easy for this year’s Platteville girls basketball team. Trailing by 12 in a regional final, any other team might have folded. Not coach Mike Foley’s battle-tested Platteville girls. 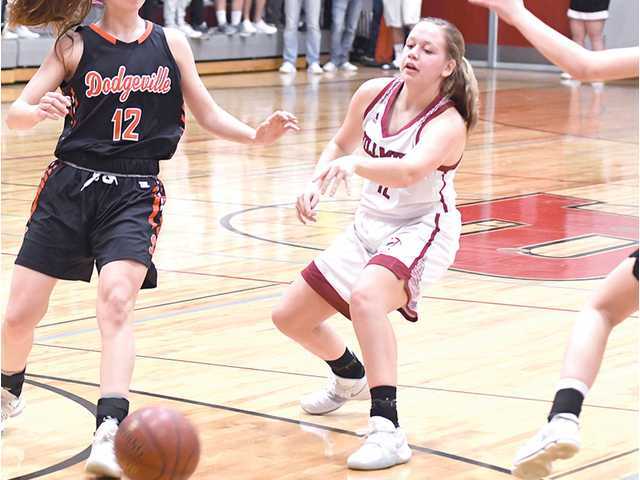 The second-seeded Hillmen rallied from a 38–26 deficit early in the second half to nip third-seeded Lodi 47–46 to claim a fourth straight WIAA Division 3 regional title, the first under Foley, who took over the team this season. Junior Josie Nies began Platteville’s tide-turning run with a 3-pointer with 12 minutes left, one of three for her on the night. Lodi (17–6) built its double-digit lead behind the strong play of sophomore Lauryn Milne, who scored 13 of the Blue Devils’ first 36 points. The visitors tried to slow the pace and run clock, but Platteville was able to turn up the defensive pressure and held Milne scoreless the final 15 minutes of the game. Junior forward Sami Martin also had a big second half for the Hillmen. Martin scored while being fouled to tie the game at 41–41 with 3:42 left. Platteville took their first lead of the second half on a transition layup by Becca Hoyer on a feed from Nies with 1:30 left. Hoyer then came up with a steal and converted a breakaway layup moments later to make it 45–41. Lodi senior Alana Gilles connected on a deep 3-pointer with under 30 seconds to play to make it a one-point game. Gilles finished with a team-high 14 points. Martin was fouled on the next possession and made a pair of pressure-packed free throws to make it 47–44 with 13 seconds to play. Lodi could not get an open three for the tie and Rhianna Walzer scored tried to draw contact on a drive to the hoop and scored a layup with two seconds left and time expired. “Our key to the win was playing team defense and being patient on the offensive end,” said Foley. “We valued each possession and we were able to convert on high-percentage shots at the end of the game. Martin finished with a game-high 15 points. Hoyer scored 14, Nies had 13 and fellow junior Izzy Carroll chipped in five for the Hillmen, who improved to 19–4. Platteville will now face top-seeded Prairie du Chien (20–1) in a Division 3 sectional semifinal Thursday at 7 p.m. at Madison Edgewood. The Hillmen ended the SWC champion Blackhawks bid for a perfect regular season with a 52–44 victory at PHS on Feb. 16. PdC won the first meeting between the two teams on Dec. 14, 51–41. Platteville opened the D3 regional playoffs with a first round bye last Tuesday, then hammered SWC rival Dodgeville 52–27 Friday night. Martin scored a game-high 18 points and grabbed 13 rebounds to lead the Hillmen. Hoyer added 14 points, four boards and three steals. Dodgeville (9–14) — AJ Phillps 1, Jojo Heimerl 1, Grace Borne 5, Caitlyn Blume 2, Olivia Argall 16,. Totals – 8 10-12 27. Platteville (18–4) — Morgan Mumm 1, Becca Hoyer 14, Josie Nies 7, Sami Martin 18, Maddie Cooley 2, Madison Devlin 2, Izzy Carroll 4, Allison Cooley 2 Kaycie Wagner 2. Totals – 22-50 7-20 52. 3-point goals — D: 1 (Argall 1), P: 1 (Nies 1). Total fouls — D: 14, P: 17. Fouled out — P: Hoyer. Lodi (17–6) — Olivia Wendt 2, Lauryn Milne 13, Jaden Kolinski 8, Taylor Ripp 4, Rhianna Walzer 4, Alana Gilles 14. Totals – 18-35 6-8 46. Platteville (19–4) — Becca Hoyer 14, Josie Nies 13, Sami Martin 15, Izzy Carroll 5. Totals – 18 6-8 46. 3-point goals — L: 4 (Milne 1, Kolinski 2, Gilles 1), P: 4 (Nies 3, Carroll 1). Total fouls — L: 17, P: 10. Fouled out — none.